Let's consider the basic blackjack strategy for soft hands. And firstly we must become clear with the soft hand notion meaning. In accordance with blackjack rules we state that a soft hand is an initial two-card combination which contains an Ace. For example you have an Ace + 5 as initial hand cards. That means you obtain 16 total points soft hand. This hand is soft 'cause it contains an Ace (which cost 11 points). It's called soft because this hand will never go bust if you even take one card more to form a three-card hand (or just hit). The soft initial hand may transform into a hard one if the third card income (your hit) makes an Ace costs 1 point only. E.g. you still have an Ace + 5 as your initial hand and you achieve 8 by hitting. Then you have the third-card hard hand with 14 total points in which an Ace costs 1 point. Still the soft hand may save its flexible soft nature even after the 3rd card arrival. For example if the additional 3 points card arrives to your initial an Ace + 5 hand then the 19 total soft hand is achieved. 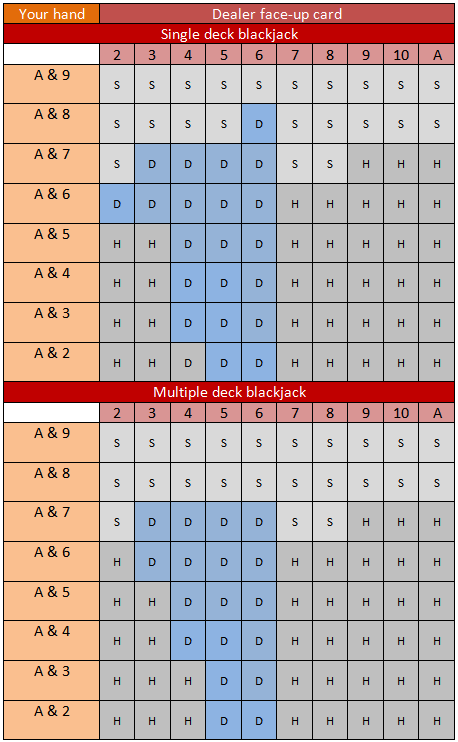 Now switch over to the basic blackjack strategy for soft hands charts (single deck blackjack card game and multiple deck blackjack variants both). E.g. if you play a single deck blackjack and have an Ace & 7 (watch the first column) as an initial hand and the dealer has 2 points face-up card (watch the third row) then you must stand (grey S cell in the chart). If the dealer has 3 thru 6 points face-up card then you must double. 7 or 8 points face-up card - again stand. 9 thru Ace - always hit. The mechanism given above is applicable for all other variants of your hands and dealer face-up cards.